Word choice: poivre or piment? I am confused about the correct word for pepper in French. My reference material for my French course indicates that pepper is poivre. My friend, a francophone, however contests that. She says the correct word for pepper is piment. (stimulation) du piment a bit of spice; le risque met du piment dans la vie danger adds a bit of spice to life. piment doux sweet pepper; piment rouge red hot pepper, chilli; piment vert hot pepper. pepper; poivre moulu ground pepper; poivre en grains whole peppercorns; poivre blanc/noir/vert white/black/green pepper; un steak au poivre vert a steak with green peppercorns; poivre de Cayenne cayenne pepper; poivre et sel salt-and-pepper (épith); il est poivre et sel he has salt-and-pepper hair; poivre rose pink pepper berries. Note that both entries indicate pepper as possible translations! More images here, here and here. Well, both translations are right, but the one you show on the picture is indeed 'piment', the hot peppers — the genus Capsicum (as well as Pimenta). 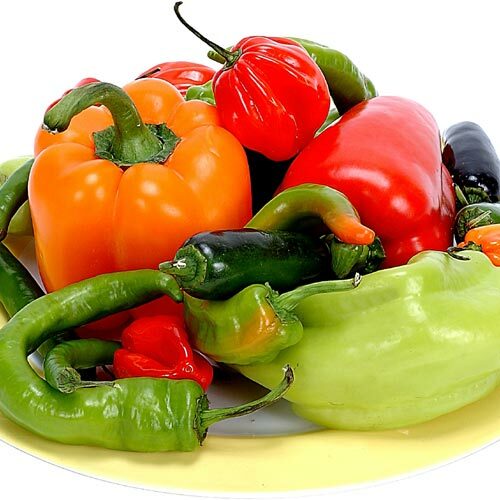 Though, the big ones on that picture, the pepper bells are not piment but 'poivron' (species Capsicum annuum). The 'poivre' version of pepper is the one that's usually on the table with the salt (grey or black pepper): the 'genus Piper'. And as a note, the jalapeños peppers (piments) in France is not as widely known as in US or UK, we only differentiate hot peppers by color (piments verts, piments rouges). "Pepper" has a few different equivalences in French, depending on what you're referring to. There are basically three different words: poivre, poivron and piment. Poivre is used to refer to the spice. Therefore black pepper will be poivre noir. Other examples include poivre blanc, poivre moulu, poivre à grain entier, etc. Poivron is used to refer to sweet peppers. In your picture, it would be the big orange one and the big elongated red one, which would usually be called bell peppers. Piment is used to refer to hot peppers. They are also often called piments forts. That is also where the adjective pimenté stems from, referring to the hot and spicy flavours. Depending on the region you're in, it's possible that poivron and piment are used interchangeably. In Québec, for example, piment is usually used for most fresh peppers. Not the answer you're looking for? Browse other questions tagged vocabulaire choix-de-mot alimentation biologie botanique or ask your own question. What is the best word to describe these utensils? Is 'dégueulasse' a swear word? Savoir vs Connaitre for “to know a word”? What's the word for “a paper” that you do at university?